Serebii.net talked about this a few days ago, and I'm interested in hearing more details about it! why does japan get all the cool stuff? i get its the home base of nintendo and everything. but out here in NA we still don't have a great selection of accessories for the XL and not alot of colors for it either. I'd rather have the Year of Luigi themed 3DSXL, I rally hope that makes it to EU. @19Robb92 "Looks pretty ugly IMO." Well your opinion is irrelevant here, as that is not even the XL (LL in JP) they are talking about. Nintendo has not released a photo or even said what will be on the new Pokemon 3DS LL. If you would have read the lovely Orla's article you might have understood this. Having said that; I too want that Year of Luigi XL here in the US. Let's hope they release that in the West eventually. Why don't they just produce enough of these things to meet demand and make a mountain of money on them instead of making them so ridiculously limited and turning so many potential customers away? @19Robb92 The Luigi XL is pretty ugly, imo, and, like @Prof_Elvin_Gadd mentioned, that Charizard one isn't the one they are talking about here. Although I really wish they would bring some other colors out, mainly orange, I think the Charizard one looks pretty baddonkey . 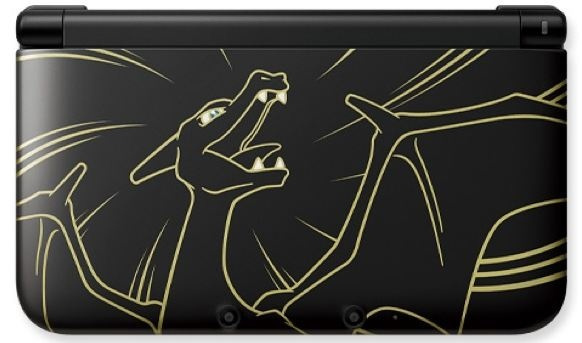 Even though I have no idea what this Pokemon 3DS will look like... I would love to have it! Would love to have it for my collection. That's good. Hopefully it'll get a better design than the Pikachu and Charizard one. They can't seem to get a good PKMN designed 3DSXL. I'm really hoping that they'll have a new pair to do a bundle with X and Y when they come out October. @19Robb92 Whoa, this current post is quite different from your original post. There was a lot of assuming going on in that original post that I see you edited out. For the better, I must say.